And wonderful thanks to my sugar high! I woke up early this morning to get in my scheduled shorter run of 3 miles. It was raining once again….sigh. So I headed out to my gym to complete my 3 miles on the treadmill. I usually hate the treadmill, but this morning’s run was easy peasy! It definitely felt easier than running outside, so I kinda felt like I was cheating. I ran at a fairly slow pace with an incline of 2 to slightly simulate being outdoors. But I was super sweaty and got to watch the local news for 30 minutes, so it was a good little workout! I also completed some upper torso strength training and 1 mile on the Elliptical before heading home to get ready for my work day. Last night, I went candy shopping for some good chocolate to give away to my Jazzercise class tonight. While I was at the store, I also bought some goodies to bring into work today! 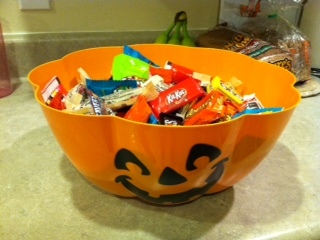 Halloween + my birthday (tomorrow) = lots of splurging on sweets. 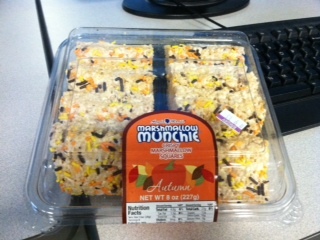 Rice crispy treats had to make an appearance in our office. They weren’t homemade obviously but still delicious. 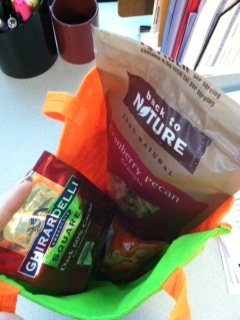 I was also greeted with a birthday gift from one of my awesome coworkers that included some sweets, but also some healthy granola! The bag also lights up. Cutest thing ever. 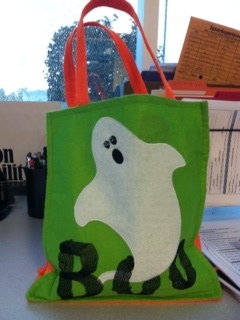 It was stuffed with granola, dark chocolate, organic granola bars, and more candy corn. She knows me a little too well! 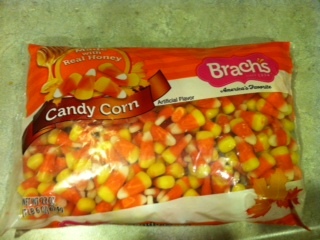 So needless to say, I’ve been on a candy corn high all morning. Mac has on his jammies first thing this morning. In our dark house, he was a little glow-in-the-dark skeleton! Tonight he will have to change into his T-Rex outfit while Nick and I hand out candy. 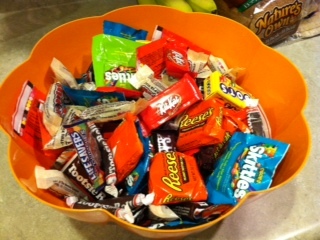 We are stocked and ready for some trick-or-treaters! Nick will hand out candy until I get home from Jazzercise around 7, and then I’ll help. I love seeing the little cuties in their costumes. I have no idea how many we’ll have since this is my first year in this house. Hopefully we get enough coming by to at least give away all our goodies! Hopefully I’ll have time to check in later with some fun pictures from our Halloween Jazzercise class. I’m off work tomorrow for my 24th birthday, which means no early bed time for me! Woo! Happy Halloween from our little family to yours! I hope you eat too much candy and enjoy everything that goes along with this spooky day! 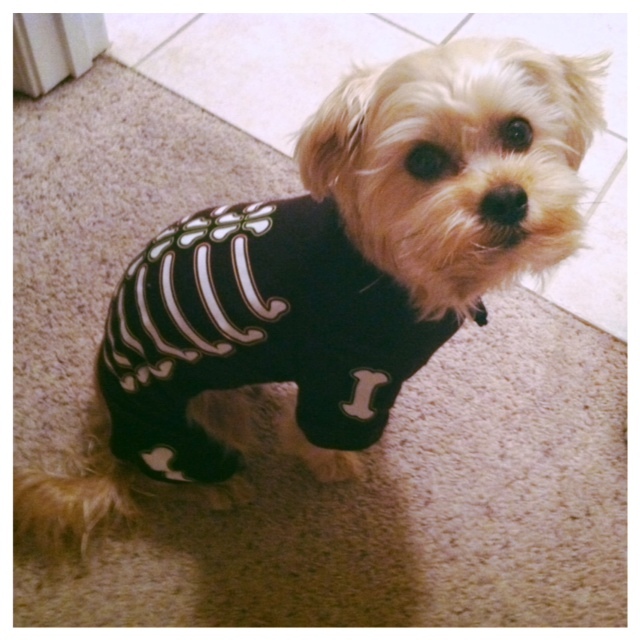 I LOVE Mac’s glow-in-the-dark skeleton pjs! I think he secretly loves them too!